OK, this is hilarious and I thought I would share it. I am kindof a sports nerd, so I check ESPN.com daily, listen to sports talk radio, and watch SportsCenter a lot. 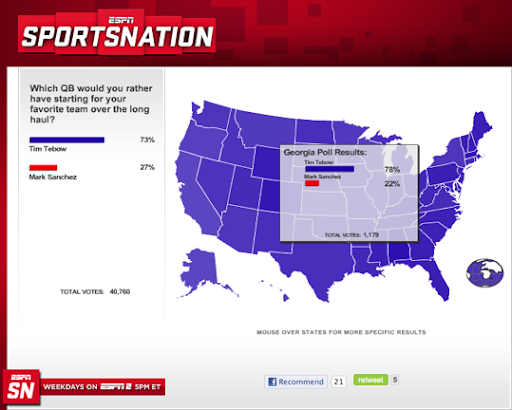 Tonight, when I was looking at ESPN’s homepage, i saw this poll. I knew that everyone was in love with Tim Tebow, but I had no idea how much. You would think all of the “gator hater” Georgia, Alabama, Ohio State, etc. fans would be down on him. You would think that all the more liberal states would be down on him. But NO, as of right now ( about 40,000 votes ) he has a 30 to 50% point lead in a head to head vs. Mark Sanchez. Everyone has been down on Sanchez this week as stuff is coming out about the Jets locker room issues and work ethic during practice. It’s really just because they have a coach that talks a lot, and then they didn’t go to the playoffs. That being said, Mark Sanchez has helped the Jets win 28 regular season games over the past 3 seasons. But you know what, I voted for Tebow too, hahaha! You can’t help but root for him and the Broncos if you watched any of their crazy wins this season, especially the last one vs. the mighty Steelers. I guess I too am a Broncos fan after the Falcons got embarrassed. GO Tebow! Just read a really good article on Tim Tebow written by Rick Reilly. It is well worth your time.